When I looking at the meat section at the grocery store I see there is getting to be more organic labeled meats and that makes me wonder what is in organic meat? Is it safer, more nutritious, more sustainable, and is it worth the price? These are questions that need real answers. We have raised beef and meat chickens for a few years and I have found certain methods that really improve the quality of the meat and these methods often go beyond what is considered organic protocol. I will share with you what I have learned about the difference between organic and grass fed or pastured meat and you can see great sources of high quality meat by going to our store. The term “organic” is being used a lot these days and it brings different thoughts to different people based on your concept of what organic means to you. Some see it as a novelty or a lifestyle status. You may see it as a safety measure. Then some may see organic as a nutritional standard. Yet some folks just see it as a marketing gimmick because after all isn’t all food organic? In many ways the organic name has been misunderstood and in many cases abused. I would like to make some clear distinctions between what “organic is and is not. To get an idea of what organic meat means we can take a look at what a farmer has to do to meet organic standards. Here are the basic requirements that must be met by organic certification according to the USDA . 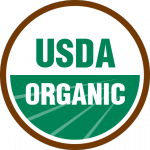 Inspected by a USDA National Organic Program authorized certifying agent on a regular basis to be sure the producer is following the organic criteria. Produced without genetic engineering (GMO), ionizing radiation, or sewage sludge. Managed in a manner that conserves natural resources and biodiversity. Access to fresh air, sunshine, room to exercise, clean water, shelter and clean bedding. The animals must spend most of their lives on certified organic land and get at least 30% of their feed from that pasture. The remaining 60% of the feed needs to meet organic standards but not necessarily from pasture. No antibiotics or medications that the USDA has listed as not approved for organic standards. This is the basic but not exhaustive list of regulations that an organic farmer needs to follow. These are great standards and they do help eliminate many of the problems associated with confined feeding operations (CAFO) and it does provide for less exposure to chemicals and genetic engineering. As great as the standards are for certified organic growers there are some flaws in this system and there are a few items that get overlooked but keep in mind that government regulations can never offer the complete protection that a knowledgeable consumer can provide for themselves. Always keep in mind that our government that provides organic standards to follow is also the same regulatory body that approves all the chemicals and genetic engineering that folks are trying to avoid by buying organic food. Here are a few other things to consider. Nutrition – Granted that organic standards do help improve nutrition quality however they don’t guarantee nutrient dense meat. We strive to make our soil as nutrient fertil as possible to produce nutrient rich plants that produce nutrient rich meat. All nutrition starts with the dirt. Proper feed – Organic standards require the animals to have access to pasture but if the pasture isn’t producing enough forage for the animals they are fed other feed and even though it is considered organic it doesn’t mean it is the best for the animals. In regards to ruminant animals such as cows they are allowed grain in the last 1/5 of their life and even though this puts weight on the animal it doesn’t put quality into the meat. Keep in mind that a cow is a four stomach herbivore that was perfectly designed to thrive on grass. Vaccines – Antibiotics and most medications are not allowed to be used however vaccines are allowed. This is a very hot and controversial topic but research shows no benefit to using cattle vaccines and in most cases the vaccinated herds have more health issues than non vaccinated ones as the vaccines are shown to actually diminish the animal’s immune system. 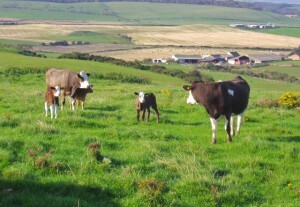 Proper land and animal management is the most important factor in animal health. We are not certified organic but we follow all the standards that are set forth by the USDA however there are areas that we improve on to get the maximum quality in the meat we raise. I will show you what we have found that works. Quality nutrient rich grass is key. We keep our animals on the best lush green grass as much as possible and we do that by keeping them in small areas and move them daily to fresh forage. It is like getting a fresh new pasture every day. This method is often called rotational or managed grazing. We do this with all our animals and it provides the best possible food for them on a regular basis and it keeps them away from their manure which can be a source for pathogens and disease. A great deal of research from independent test labs has shown that totally grass fed beef has the highest levels of conjugated linoleic acid (CLA) and a more balanced ratio of omega-3 to omega-6. The vitamim and mineral levels are much higher than conventionaly raised meat and totally grass fed animals on high quality grass has even more nutritional value than organic brands. If you are truly seeking to get the very best meat that can be grown the only way to be sure of the quality is to look locally and find a farmer that is using the proper techniques and see for yourself how your meat is being raised. Fortunately there is getting to be more farmers that raise top quality meat and sell locally and there is also more places online to help people find good local growers. Ask questions and take notice of certain conditions. Are the animals always on fresh pasture? You don’t want to see much bare dirt. Do they have access to fresh clean water and natural mineral supplements? Does the farmer use any pesticides or herbicides or chemical fertilizers? Does the farmer feed any grain? Cows don’t need grain and poultry and pork needs to be GMO free grain. Do the animals get any routine antibiotics or vaccines? If they do get medications for illness are the animals processed for meat? Do the animals look clean happy and healthy? Are the animals harvested in a safe humane manner? Ask about the butchering process and who does it. Don’t be afraid to ask questions because this is your food and you are what you eat. I enjoy getting asked questions like these because it shows me that the person is serious about thier food and that thy have done their homework to know how good healthy meat should be riased. Questions like these help keep me accountable and gives me the motivation to do the best I can not only for our own family but for our customers as well. If a farmer balks at your questions and doesn’t take you seriously then that is a good sign to move on and look elsewhere. Here are a few websites that can help you find local food sources. We live in a time and place where people want to see certification labels and some folks still want some sort of a safety reassurance that their food is coming from a producer that is being watched by a third party inspector and that is a legitimate issue that can be addressed. A good certification to look for is Certified Naturally Grown because this is an independent certification program that doesn’t have any ties with corporations or government and their standards are much higher than the USDA’s. The standards are higher but the burden of unnecessary paperwork and fees are much less so the cost isn’t passed on to the consumer. For some of you it just isn’t feasible to find a local farmer to provide the quality you want. You may also just want the convenience of quality meat being shipped to you door. If that is the case there are two companies online that stand out as offering the quality and safety that we should expect and you can go to our page about where to buy grass fed meat to see why I recommend them. Keep learning more about the food you eat as things are changing quickly and some is good and some is not. Strive for the best even if it means aiming for quality over quantity. Smaller amounts of healthy meat is better than consuming larger amounts of unsafe products that you have no idea about its journey to your plate. I hope you find this information helpful and I would like to hear your thoughts on the subject of organic meat. Leave your comments below and if you disagree with anything here let me know that as well in a respectful manner. Thanks and God bless! Thanks for the great honest discussion about organic meat. It’s really cleared up some things for me. Found it really interesting that 60% of the animal’s feed can be from non-pasture. 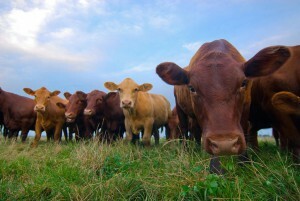 Does this mean that “grass fed” beef could actually be 60% grain fed? Also Would this affect the quality of the meat if this is the case? Yea Nathan, the USDA allows cows and other rumminant animals to have grain 120 days before buthcering. Even though the grain is supposed to be certified organic it puts more fat on the animal but lowers the quality of the meat. The best beef is 100% grass fed and finnished. I have read extensively about grass fed beef and actually live near a farmer who raises cows for that market. Every honest study has determined there are distinct advantages to organic meat. I agree, it’s best if you can get to know who is raising your food, or raise it yourself. However, for most people that simply isn’t possible. Thanks for your thoughts! You are right that many people can’t get their food direct from a conscientious grower but there are getting to be more good quality minded farmers and with the increasing demand for safe nutrient dense food there will be more coming into the market. 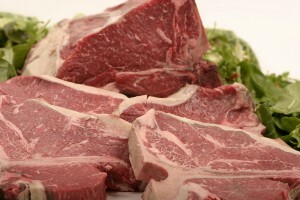 The search for quality meat is tough for some folks and that is why I give some recomendations on our store page of this website. Hi! Thank you for this great article, it was really clarifying and intresting! Do you think I can be sure that the organic-labelled meat had actually have an organic-method? Do you think there is “scam-potential” in this? Thanks for your comment Adam! You have a very legitimate concern and it is concerns like yours that motivated me to write this post about organic meat. To start with if you look behind the scenes and see how conventional beef is raised in confined feeding operations (CAFOs) and what the animals eat you wouldn’t want to eat the meat. As far as organic scamming I will say that there may be some price gouging in some instances but not always since it does cost more to produce organic but if the farmer is following organic protocal there is less exposure to chemicals and genetic engineering. The very best way to get top quality meat is to buy local 100% grass fed and finished beef. Thanks for sharing Adam! You have a remarkable website! Congrats on a job well done! I like it. I am a vegan, but there was a time when I did eat meat. I think it is great that you raise non GMO chicken from May to October. I have a question for you. Do you vaccinate your cows and chickens? If you do vaccinate your cows and chickens, is the meat still considered organic? Thanks for stopping by even if you don’t eat meat at this time and thanks for the possitive comment. We don’t vaccinate any of our animals (or kids for that matter) since all the independant research shows it does more harm than good. We rely on good pasture managment and that keeps our critters happy and healthy. There really isn’t any vaccine for chickens since it isn’t effective to vaccinate them in larger operations that have thousands of birds so they just put antibiotics in their feed instead. We don’t use any antibiotics. A certified organic farmer can use vaccines for their cattle and some do but we don’t. Wow I never gave much thought to organic or non organic and just bought any meat. I never even considered any of this stuff. You did a really great job listing how important it really is. My favorite thing you said was to get to know the farmer. That is honestly really good advice and the best way to know you are getting quality meat. And I like the information about grass feed cows being better to eat. Overall, this was really informative and you probably just changed the way I shop for meat. Thanks! Glad you liked the post Dylan! I didn’t pay any attention to what I ate until the past few years and the more research I do the more I see the great importance of seeking quality food. Raising our own beef and chicken has really shown us how drastic the difference is from commercial raised meat to naturally raised meat. Keep looking and learning! Thanks for checking us out. Organic meat better be more nutritious, more sustainable and safer specially because the price we are paying for it. I found your post extremely helpful since I am always trying to inform myself about the food I eat. Your advise is extremely helpful! I have already been navigating through the websites that can help people find local food sources. The high price of organic meat is a factor we all look at and wonder if it is worth it. That is why I recommend buying local from a farmer that is using organic principles or better to get the best meat at an affordable price. The farmer doesn’t have to be certified organic by the USDA to have top quality products as long as you have a relationship with the farmer and know what you are getting. It is the best for the consumer and producer. thanks for the comment! I am happy I stumbled onto your website, I am very big on nutrition and grass-fed meat. I think grains are not healthy for us the way it is grown and processed today, sometime I wonder if the food labels are correct or not? what is your opinion, can we truly trust the food labels on the foods we are buying today. It sure is hard to know what is all in our food and labels are not always telling you everything. That is why it is so important to buy local and know how the food is grown.